Origami : What is Origami ? Origami is a paper folding art that originated in Japan. It involves folding paper to make different kinds of 3-D objects. Origami has slowly been picked up as a hobby. Many schools have started having special classes for it, as a part of co-curricular activities etc. as it helps in developing creativity, being careful and accurate with things and also develops better concentration. 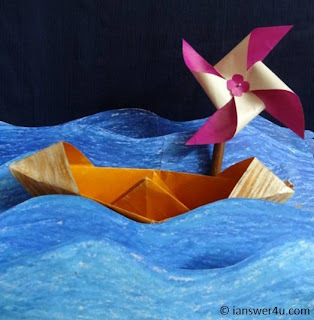 Some of the common origami toys are airplanes, boats, birds, flowers, animals etc. Does this remind you of the fun filled school days when you made paper planes and used them as a weapon on your mates?? (Essential part of primary school, isn’t it?) And yes, that’s a classic example of origami!!! If you had fun while making those boats and planes you can try other sophisticated and difficult origami objects. They are available in the form of origami kits, which have a specific type of coloured paper required for the activity, a set of instructions along with diagrammatical explanations so that it is easy for the person to understand exactly what is to be done. No special tools are required for origami. Only basic ones like scissors, ruler, pencil, eraser etc are required for accurate measurements. Though it may seem like an easy thing to do, origami requires high precision.You can’t afford to be gawky here. But don’t get discouraged! Just keep in mind that you are in line with the instructions and do the folding accurately. Folding should always be done according to the dimensions and exactly the way mentioned in the instructions. A lot of care must be taken to make origami toys. Otherwise, a clumsy attempt at a cute flower could probably lead to a frog! (That would be good too.) But yeah, the slightest disruption in folding, could lead to a bad output. So, the origami’s golden rule is follow all the steps accurately. First timers can use normal sheets of paper or even newspaper, to get an idea of what exactly is to be done. Ideally, practice on plain sheets so that the crease marks don’t spoil the paper, in case of mistakes. Using different kind of paper will give different effect to the object. Specific coloured paper is required for different objects depending on the object. Some Special Tips to make Perfect Origami Product. How to make Glass Painting at home?